How did Davy Crockett save President Jackson’s life only to end up dying at the Alamo? Was the Lone Ranger based on a real lawman-and was he an African American? What amazing detective work led to the capture of Black Bart, the “gentleman bandit” and one of the west’s most famous stagecoach robbers? Did Butch Cassidy and the Sundance Kid really die in a hail of bullets in South America? Generations of Americans have grown up on TV shows, movies and books about these western icons. But what really happened in the Wild West? All the stories you think you know, and others that will astonish you, are here–some heroic, some brutal and bloody, all riveting. 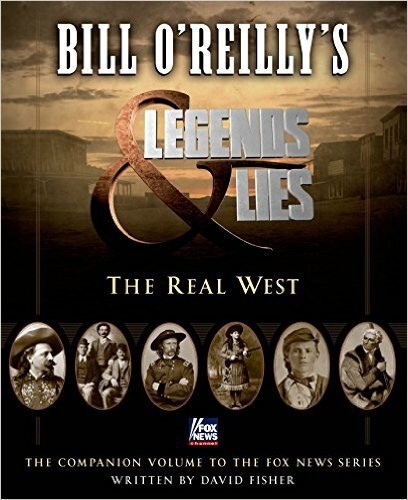 Included are the legends featured in Bill O’Reilly’s ten week run of historic episodic specials-from Kit Carson to Jesse James, Wild Bill Hickok to Doc Holliday– accompanied by two bonus chapters on Daniel Boone and Buffalo Bill and Annie Oakley. Frontier America was a place where instinct mattered more than education, and courage was necessary for survival. It was a place where luck made a difference and legends were made. Heavily illustrated with spectacular artwork that further brings this history to life, and told in fast-paced, immersive narrative, Legends and Lies is an irresistible, adventure-packed ride back into one of the most storied era of our nation’s rich history. I really enjoy reading about the Old West. So when I saw this book, I knew I wanted to get it. I found it to be a different view about the Old West. I do not now if this book is a hundred percent accurate, but it did change my view on a few famous western figures. It was a good read and I enjoyed it.